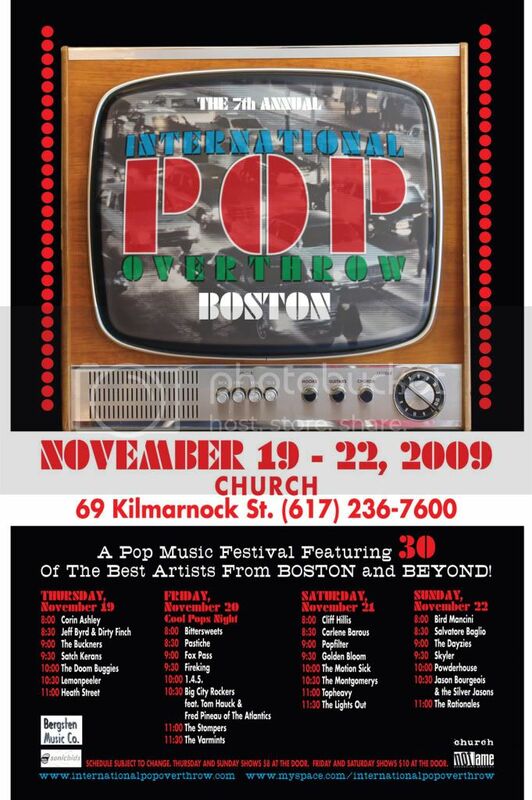 International Pop Overthrow is the multi-city / multi-national showcase for hundreds of kindred spirits that love the kind of rock 'n roll that was "pop" in '60s and '70s. A lot of bands still take that classic formula that was taught to us by The Beatles, Beach Boys, Byrds, etc -- and the bands that followed -- and put their own twist on it. The meaning gets stretched to cover all sorts of bands. Whether jangly, fuzzy, punky, rootsy, and/or whatever else -- the reignind concept should be to make song-oriented music -- to "serve the song". With 7 (or 8) performers doing short sets, you're bound to hear something you like. Quite a few of them have played the Boston festival in the past couple years. So you can catch some of your favorites and find some new faves. My advice is to go to any show that you can and bring open ears to love some new music. Maybe pick a night that has a band that you already like... or a band that you've wanted to see... I've always had a good time at an IPO show in Boston (or LA). awesome ..thanks for letting people know..